“A&S Bagels in Franklin Square made the list for top 20 best bagel shops across the country in a study conducted by MSN.com. 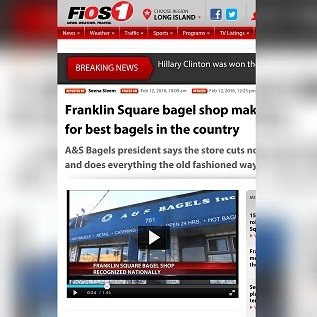 The 24/7 bagel shop on Hempstead Turnpike is making its presence known.” Source: Sleem, Seena,“Franklin Square bagel shop makes list for best bagels in the country.” FIOS1News.com (February 12, 2016). A&S Bagels, Inc. is a wholesaler and retailer of delicious New York bagels, bialys, muffins and more. The Z-100 radio morning show (100.3 FM) chose A&S Bagels as Long Island's Best Bagel. Our customers voted us "best bagel joint" on a poll taken by New York's ABC station. We have been recognized as a top 20 bagel store in the United States of America. Additionally, our great-tasting NY bagels were featured on the CBS morning news, Fox 5, ABC Channel 7 NY, Newsday.com, News12.com, Long Island Pulse Magazine and Long Island Weekly. We also have been mentioned on the Hofstra University Radio Station and on the Howard Stern Show.